This article is about the NPC. For the song, see Ragnar the Red. Ragnar is a Nord miner who lives and works in Karthwasten. He is Ainethach's right-hand man, claiming that his employer is "a good man". He sleeps in Karthwasten Miner's Barracks from midnight to 8am, and works in Sanuarach Mine between 8am and 8pm. He spends the rest of the evening relaxing in the barracks. The only exception to the schedule is during your first visit to Karthwasten, when he and the other miners will be seen arguing with Atar and his fellow mercenaries. If Ainethach is alive, Ragnar may tell you his position in Karthwasten, "I'm Ainethach's right-hand man. I help supervise the mines." 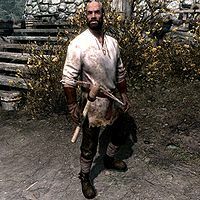 He will tell you more about Ainethach, saying, "Not many Nords would work for a Reachman, but Ainethach is a good man." If you have not resolved the situation, he also will comment on the mine ownership dispute, saying, "Forsworn attacks are bad enough, but those sellswords are worse. ", and "You should talk to Ainethach if you have business with the mine. Not that there's much these days." if Ainethach is alive. If Ainethach is killed, he may say to you, "Ainethach is dead. What will happen to Karthwasten now?" During The Heart of Dibella, if you tell him you're looking for a little girl, he will reply, "I think you might be looking for Enmon." Ragnar wears a set of miner's clothes, a pair of gloves, and a pair of boots. He is equipped with a pickaxe, and carries a key to the miner's barracks, as well as a selection of lower-class loot and gold. Lash: "I've been thinking, would you like to join me in hunting?" Ragnar: "You want me to hunt with you? I thought you preferred being alone." Lash: "Your arms and legs are fit for catching strong, agile prey. I could use your help." Ragnar: "I'd be honored, but I have work to do in the mines." Lash: "When will Sanuarach Mine be open?" Ragnar: "I don't know. Whenever those Silver-Blood men decide to leave." Ragnar: "I haven't seen you hunting in a while." Lash: "I can afford to buy meat now. I prefer working in the mines, anyway." Lash: "Tell me, Ragnar, what do you think of the Orcs?" Ragnar: "Cunning warriors and skilled workers. It's good to have you here, Lash." Lash: "I asked what you thought of the Orcs, not about me." Ragnar: "Oh. I'm sorry. Well, it's good to have you here, anyway." Lash: "You have strong arms. You'd make a good Orc." Ragnar: "Um... thank you, Lash. You'd... make a fine Nord?" Lash: "Don't say words you don't mean." Belchimac: "Damn Nords. Always getting in the way of us honest folk." Ragnar: "What did you say? You lazy coward, I'll cut your throat." Belchimac: "Nothing, Ragnar. Please... don't hurt me." Ragnar: "I... I'm sorry, Belchimac. I didn't mean that." Ragnar: "You're always talking about the Forsworn. You aren't thinking of joining them, are you?" Belchimac: "Maybe I will. What do you think about that?" Ragnar: "I'm warning you. Those people are killers. You'd never last a day with them." This page was last modified on 13 February 2015, at 14:41.